This is one of those good news/bad news kinda deals. The good news is that this dish turned out way better than I had hoped for on a first try. The bad news is that it took me nearly two years to make. Don't worry, it won't take you as long. No matter. Thanks to the actions of a committed and dear friend the correct attachment for making passatelli finally came into my possession a couple weeks back. This link explains the entire sordid tale, if you care. 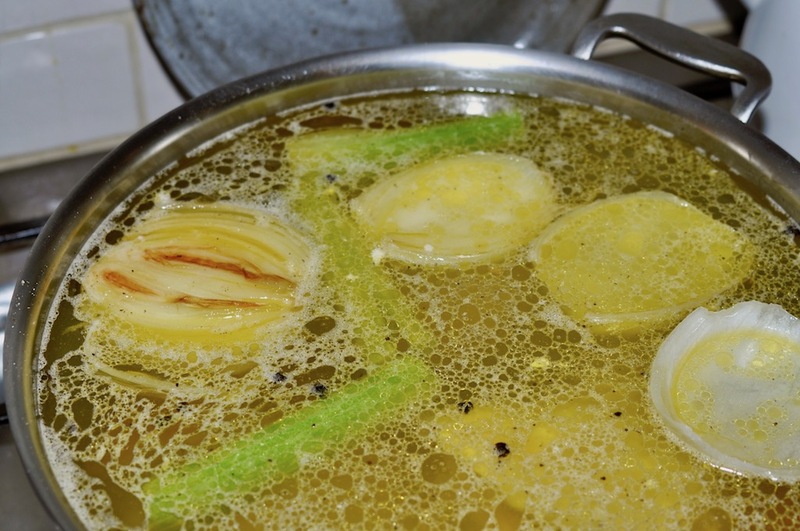 First thing you need to do is make the brodo, or broth. 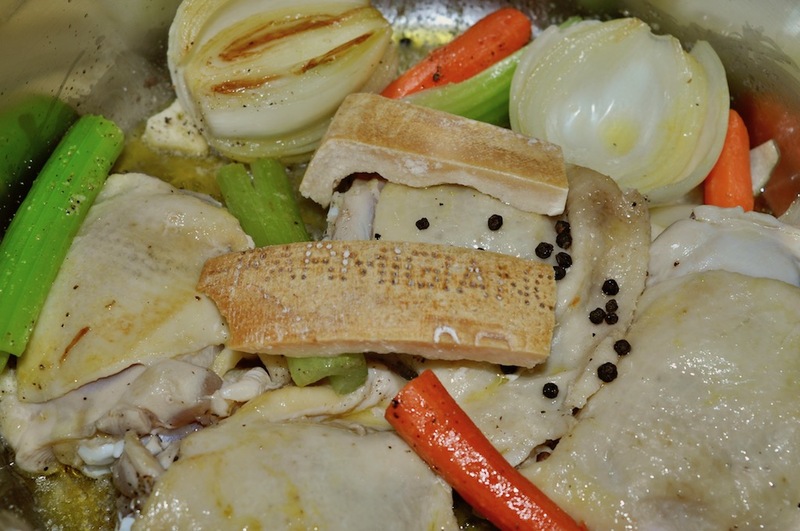 Traditionally that means a meat broth of some kind, and here I've gone with chicken. To start things off I sautéed a whole (halved) onion, a couple celery stalks, a couple carrots and four or five garlic cloves in plenty of olive oil. By the way, if you're looking for permission to use a good store-bought broth instead of making your own then you've come to the wrong place. 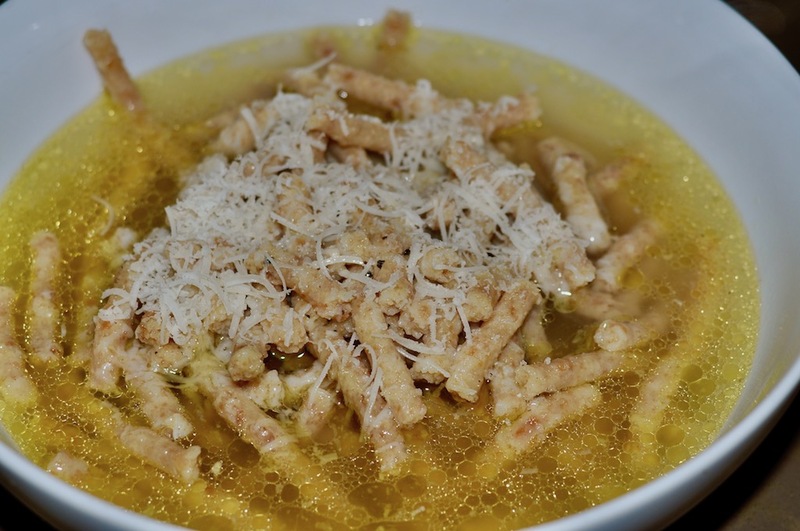 C'mon, there's like two main ingredients in this recipe: the passatelli and the brodo. 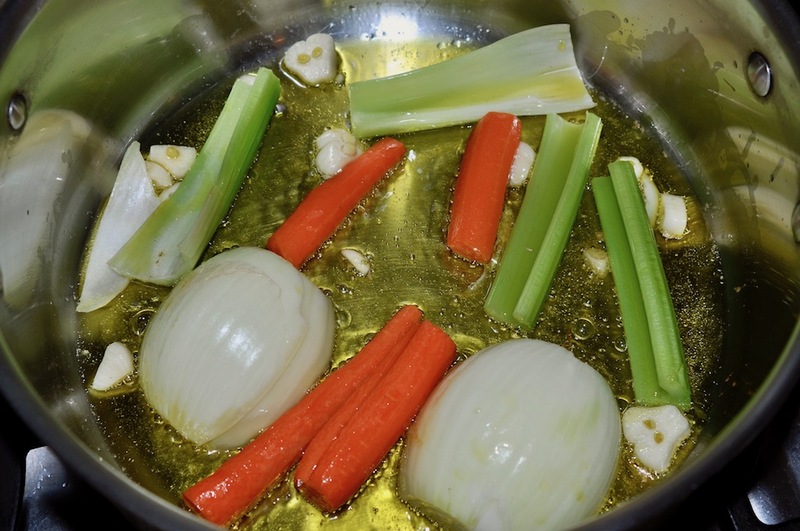 Make your own broth. You'll be much happier, trust me. After the vegetables have softened a bit add in four bone-in, skin-on chicken thighs and let them brown a bit too. 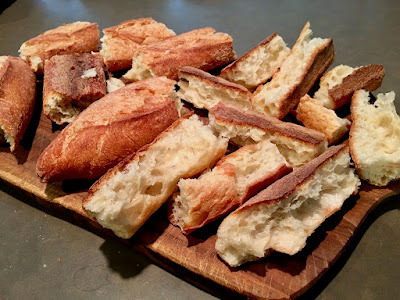 After the thighs have browned a little throw in some Parmigiano-Reggiano cheese rind (my freezer is full of the stuff, so stop by if you need any) and a few black peppercorns. Fill the pot with water and a decent hit of salt, then simmer at low-medium heat for a good couple hours or so. Then either remove all the chicken and vegetables with a slotted spoon or use a strainer if you like. You'll wind up with a pot filled with very tasty broth to cook the passatelli in later on. Okay, now for the star of the show, the passatelli. 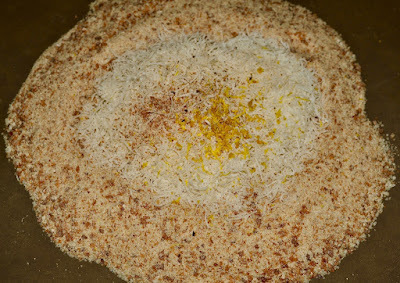 Yes, I made my own breadcrumbs, using bread from a very good bakery here in town. A few days before making the passatelli I ripped apart a baguette and let it dry out, then turned it into breadcrumbs in the food processor. You can prepare the passatelli in a bowl or on a work surface, as I did here. 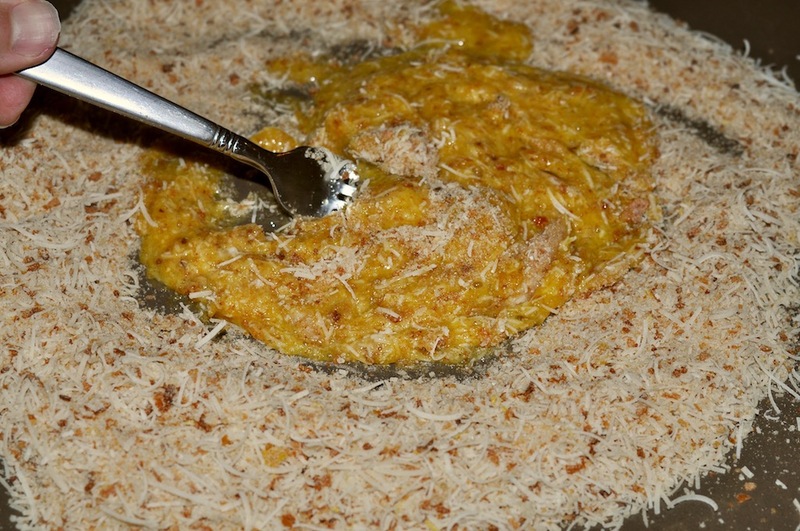 All you'll need is 1 1/2 cups breadcrumbs, 1 1/2 cups grated Parmigiano-Reggiano cheese, a good pinch of freshly ground nutmeg and the zest of half a lemon. Mix them all together thoroughly before moving ahead. Add four large eggs and incorporate until a dough forms. Actually, I need to say something here. Every passatelli recipe that I've ever looked at, including from Italy's most respected chefs, calls for just three eggs in a batch this size. Never have I seen a variation, not once. But three eggs just didn't work. The dough turned out way too dry to form proper strands of pasta, and so I added a fourth egg, which fixed everything right up. The dough should be stiff but still moist. 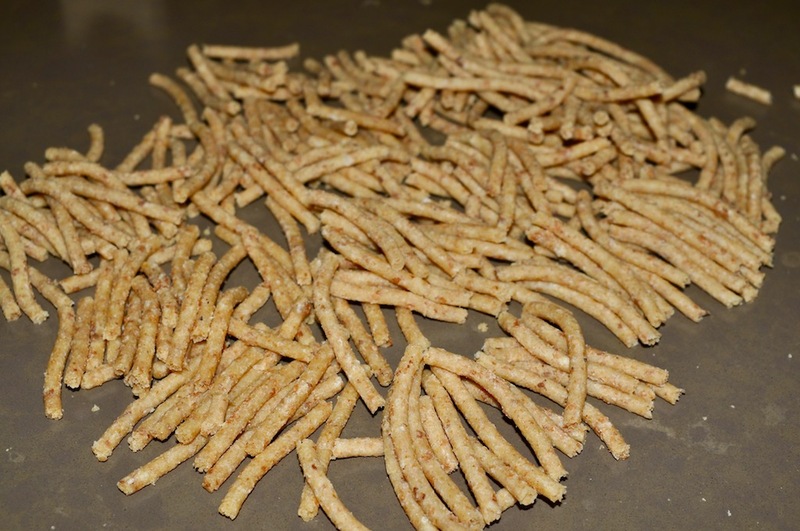 If it's too dry the passatelli won't form properly. 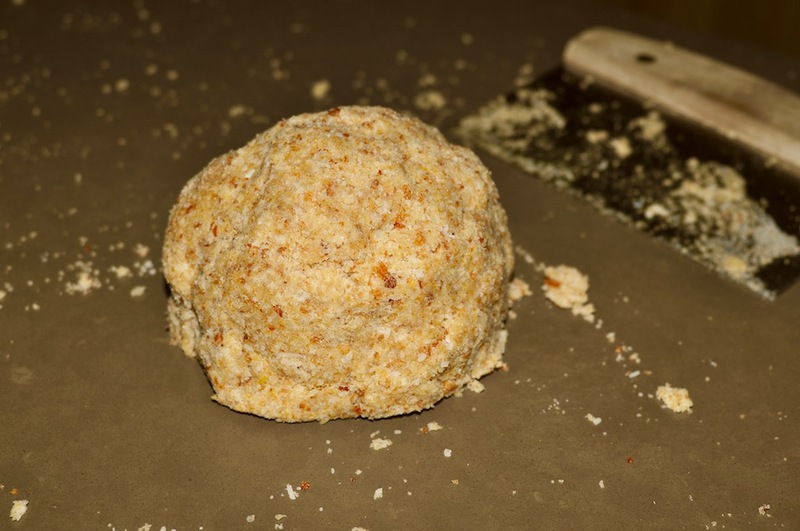 Wrap the dough in plastic and let it rest for an hour or so. 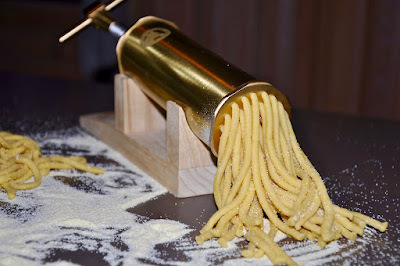 As for how to form the passatelli, I used the brass tool that I was telling you about earlier. It's a fine tool and it did a swell job. I can't wait to use it again. Your best bet, however, is to use an inexpensive potato ricer, with the largest die that comes along with it. Here's a link to the exact tool that you'll need. This is the entire batch of passatelli, which is enough for four primi pasta courses. 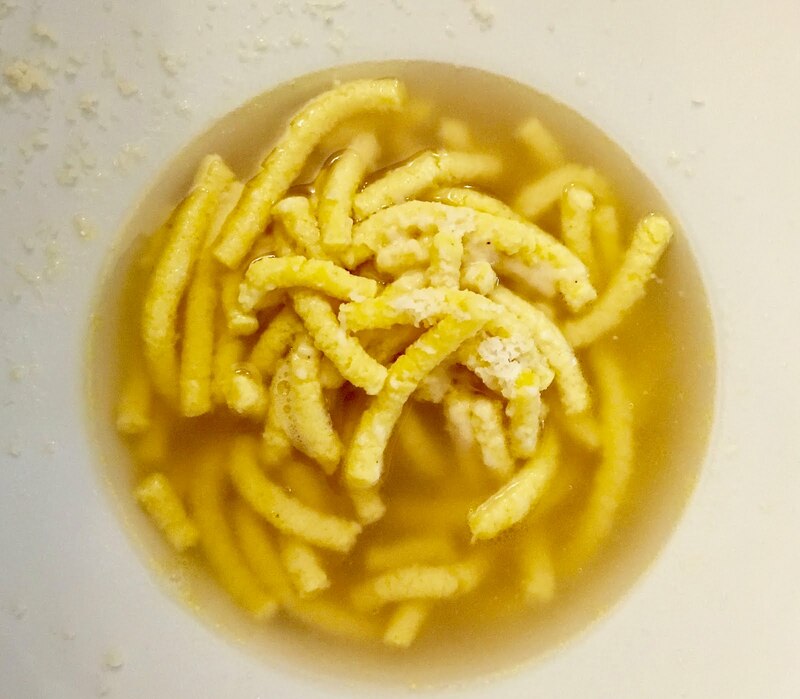 Just add the passatelli to your boiling broth and cook for around two minutes. 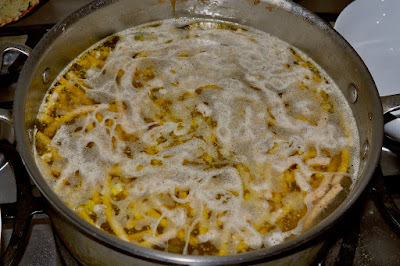 Then ladle the pasta and some of the broth into warmed bowls, grate a little cheese on top and serve right away. For purposes of this discussion the man above, known to many of you as "my friend Joe," shall heretofore be referred to as San Giuseppe. That's right, the man's a freaking saint. And I can prove it. 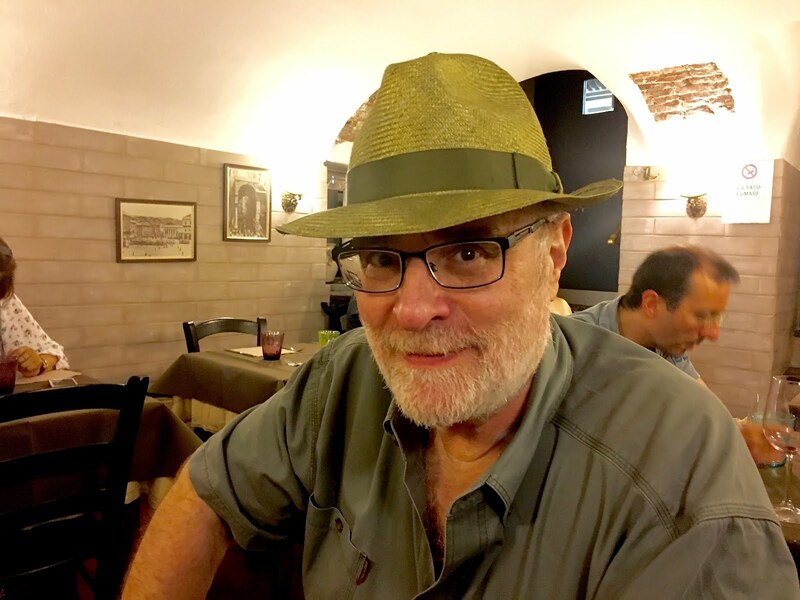 He just traveled all the way from Cold Spring, New York, to Bologna, Italy, just to do me a favor. If you're counting that's roughly 4,100 miles—each way. Why would a man do such a thing? Simple. 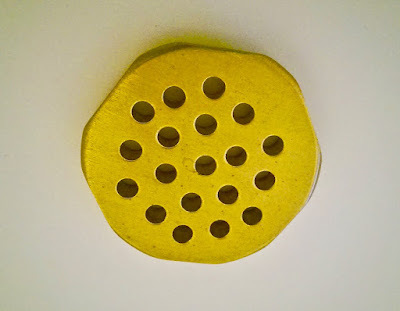 So that I could shut up already and start producing a pasta shape that I have been yelling about—very often in his earshot—for nearly two years now. You see, the last time I was in Bologna I came into possession of this totally awesome solid brass pasta extruder known as a torchietto. Here is the torchietto right here, equipped with the spaghetti die that it came with. Nice, huh? And the spaghetti that it makes ain't too shabby either. 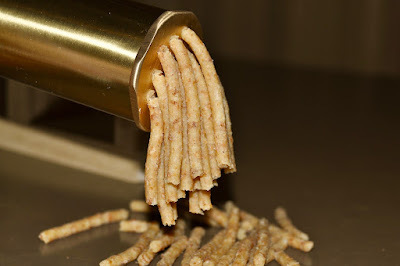 What I neglected to put hands on when picking up the torchietto in Bologna was an accompanying die for making passatelli. Passatelli is a simple pasta, in the shape of spaghetti only thicker in width and much shorter in length. It's not made with flour but with breadcrumbs, egg and cheese. Traditionally it's served very simply in a clear broth, or brodo. This, in fact, is a truly authentic passatelli en brodo, the one that I very much enjoyed at Ristorante Cesarina on Via Santo Stefano in Bologna the last time I was there. 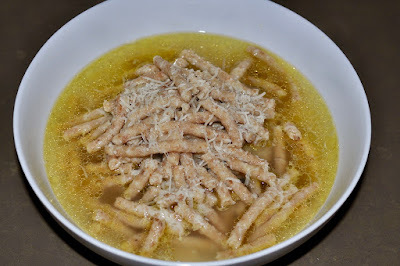 I love passatelli en brodo. And really want to make the stuff right here in my kitchen. But I couldn't. 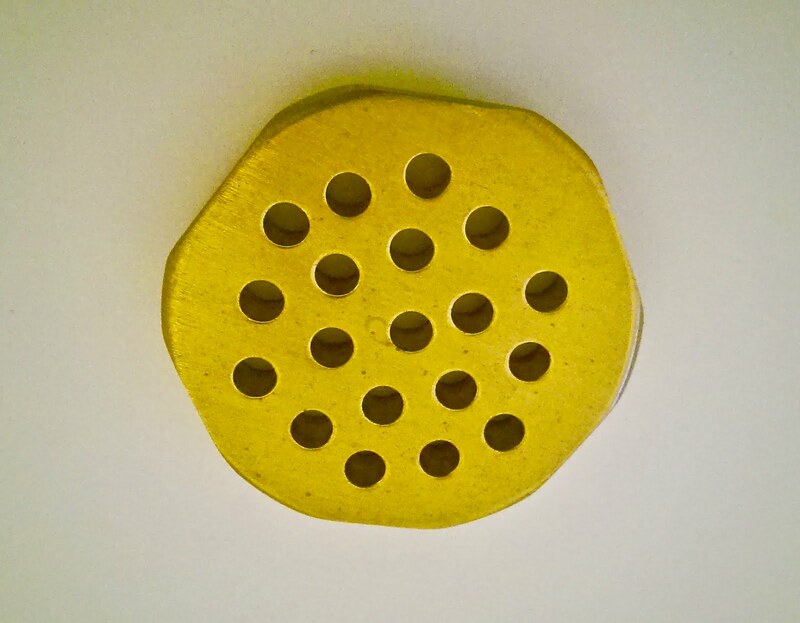 Not without the solid brass die that I had so knuckeheadedly left behind at the ancient shop where the torchietto was discovered and purchased. When he heard about this my friend Joe—at this point he had not yet achieved sainthood—was as ticked off about my oversight as I was. Not so much because he craved a taste of homemade passatelli but because, well, Joe is even more obsessive about getting things right the first time than I am. "How could you even think of leaving that place without the passatelli die in hand?" he squawked. "You make me crazy sometimes, you know that." It is sometimes said that having friends who speak their mind freely is a blessing. Only moments ago I received this photograph via email. It's the passatelli die that San Giuseppe just picked up for me in Bologna. I informed my recently beatified friend that overnighting the die would not be necessary, that I had waited this long for the die and surely could wait a bit longer. "You're already eating passatelli in your head," he shot back, knowing how closely I had been following his movements around Italy these past weeks, anticipating the exact date and time that the die and he would come together. "No reason to torture you by making you wait any longer." And so there you have it. Soon a package will arrive and in probably no time at all I'll be at work preparing what will hopefully be a successful passatelli en brodo—in my own kitchen. Thanks to my very dear friend Saint Joe.